Oscar winner Colin Firth could be the perfect person to ask about finding his voice – his virtuoso portrayal of a stuttering King George in The King’s Speech so cogently highlighted the frustrations of not having a clear way to communicate with a community. Some brands are equally tongue-tied, unclear about what the brand should sound like, leaving them either silent in social media or sounding haphazard and unrehearsed. Get over your brand speech impediments by considering the following concepts, all of which play an important role in a well-rounded social media brand voice. This is the starting point for the development or furthering of your brand voice: Who does your brand sound like? In order to determine this, you may need to first determine who your customers are, so you can assume a persona for the brand that will resonate with your primary target audience. 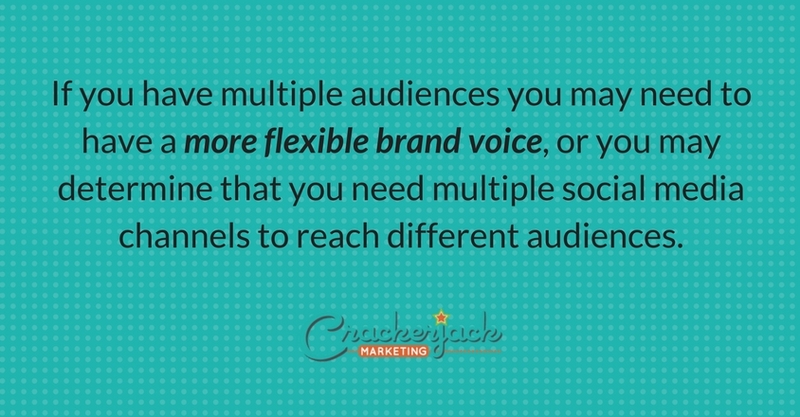 If you have multiple audiences you may need to have a more flexible brand voice, or you may determine that you need multiple social media channels to reach different audiences. Ideally you will be able to determine character attributes (see diagram) which meet the needs of the majority of your customers or users. If you’re a non-profit which raises awareness of childhood diseases, your character might be a gentle parental type. If you’re a software tools company, you might want to be a bit geeky, just right for the Star Trek crowd. Tone is the underlying vibe that emanates from your brand’s communications. This is where you establish your credibility; place your brand in the past, present or future; and subtly alert fans and followers whether your brand is going to be wide-open or a bit more buttoned up. Be a showoff if your character is something like a street-savvy hip hop artist, but know that humble usually goes farther in generating customer loyalty. Clinical or scientific could be good for a very specific B2B entity or professional services organization. Although your brand may be the expert in its field, coming off sounding like you’re smarter than your customers could turn people off pretty quickly. Establishing appropriate brand language will give you a foundation for the types of words, phrases and jargon to be used in social media communications. Want to sound very exclusive? Use insider language and acronyms. Want to sound hip? Stay up-to-date on the latest slang. But be careful – if you make a misstep in slang it’ll look like you’re trying too hard. In the end, why are you here? Your brand voice in social media can help customers understand what you want to do with and for them. Are you working to educate your user base? Do you want to delight them, and get them to visit your store or website just because they’re amused by what you’re writing? And even if you do want to sell stuff, what can you give people to help them become engaged by your brand? 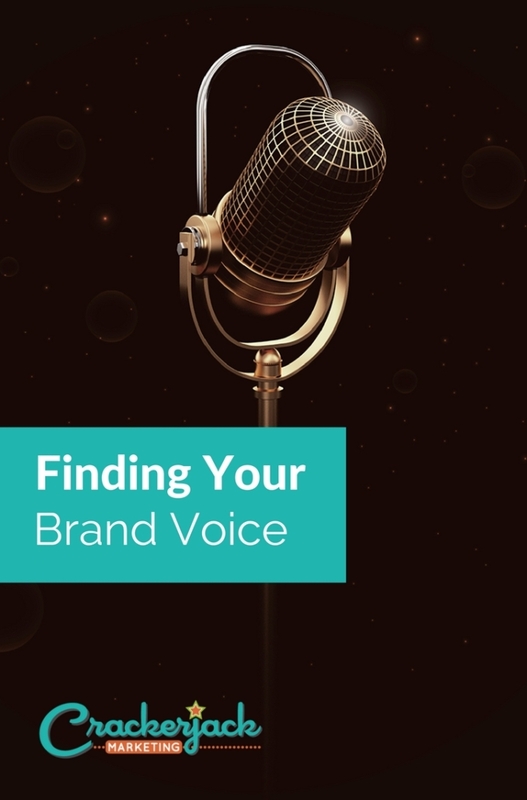 Once you’ve brainstormed around these four brand voice attributes, develop a roadmap for your brand’s voice which you can share with everyone who is involved in writing for, or speaking on behalf of, your brand in social media. This roadmap can be a simple as a one-sheeter with your brand voice attributes in writing, or you can craft some examples which front-line engagers can emulate. Add buzzwords – the words which describe your brand and which you want to have used when appropriate; for example, if you’re Disney, your buzzwords are something like: kingdom, magic, magical, family, experience, fun. 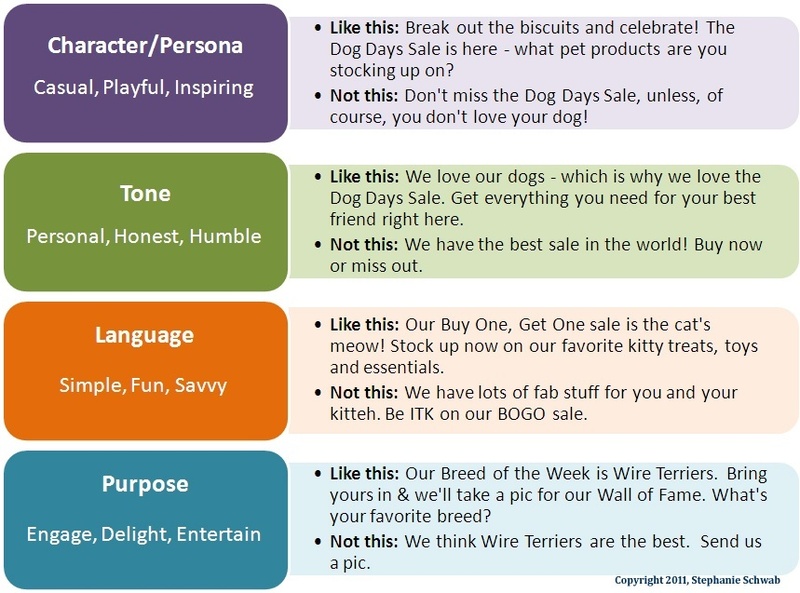 Then add some “dos and don’ts” guidelines for your engagers so they can get a feel for the types of language and content you expect them to create. Your brand voice in social media will evolve over time. 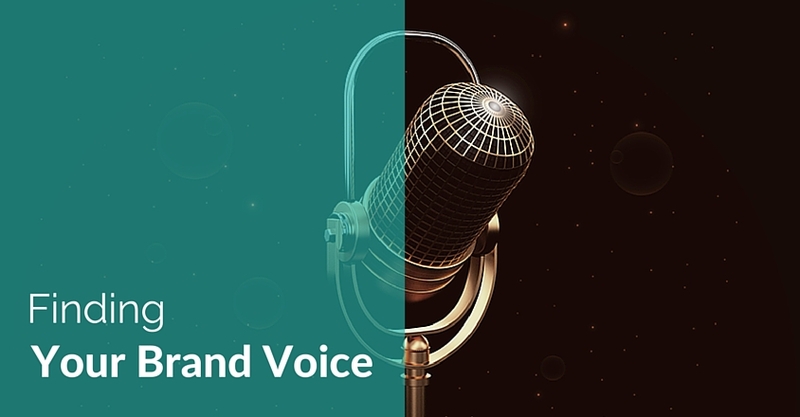 It would be great to think about undertaking a brand voice development exercise before you open a new Twitter account – but if you’ve already been engaging in social media and feel like your voice needs refinement, take the time to work on it now. Make subtle changes and your fans and followers probably won’t even notice that there was a change – but if you can more closely match your voice to their needs, you may attract even more customers and develop greater engagement and loyalty than you ever have before. This is an oldie but goodie and it’s still as useful today as it was when I wrote it for Social Media Explorer. This construct is being referenced by social media smarties everywhere, including Buffer and Kevan Lee writing for Fast Company. Are you using this in your company? Please tweet me @stephanies if you are! Stephanie has 20 years' experience in digital media and 12 in social media and content marketing, and has been blogging personally and professionally since 2004. She loves to try new social media platforms but mostly maintains her first love, Twitter, @stephanies.